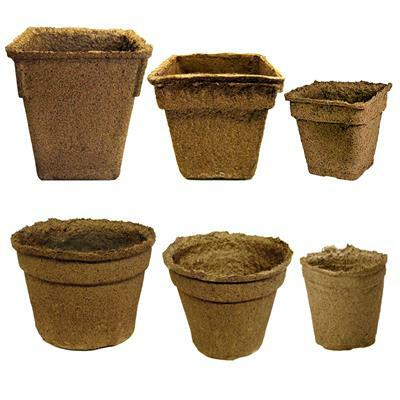 Used in conjunction with Square Form Pots, these economical vacuum-molded pots are designed with performance in mind. Available in a variety of configurations to meet different handling, labeling, and bench space requirements. An effective method of bringing potted plants to market. Pots must be ordered separately. *Width measured here is Outside Width. 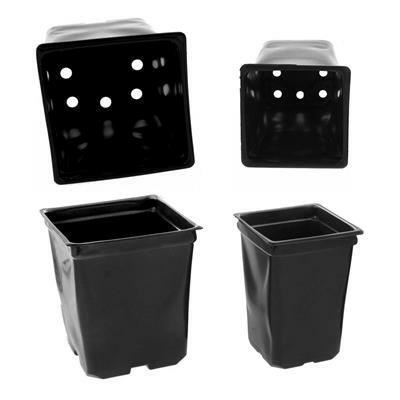 The perfect solution when using 2.5 square pots for transplants. Clean and easy to use - cuts transplanting set-up time down by 60 to 75%. Thanks! You are the best! Thanks for the convenience and the quality! Works great with the appropriate pots. These are made with quality in mind and will be and useful tool for my garden for years to come. Perfect for holding 5oz plastic containers from Walmart. They could be a little sturdier and shipping costs are still high - about a third of my cost. Have purchased many of these over the years along with the 2.5 pots which nestle within these sockets. They are and continue to be an integral component of me growing plugs on to installation size. With care, these can and have lasted 2, 3, or 4 years, mabey longer! Ideal for growing, but most appreciated when moving the crops....either across the nursery or out to the installation. One word of caution: Do not leave your investment of these trays out in extreme heat/sun. Our triple digit summer slightly warped some of my stacked trays which were laying stored next to the greenhouse skin's southern exposure. (Capt.Obvious here, and MY bad!!) All other trays filled and on the benches were fine. Even the warped ones worked, however. They looked a little funny but when pressed back into service, they gripped the small pots just fine! I'm ordering same product in other sizes this week. These trays are very flimsy and can only be carried with a 1020 tray under them. I was hoping to get something that would last for at least two years. Maybe if I am super careful they may. Was excited to find these again at such a great price. 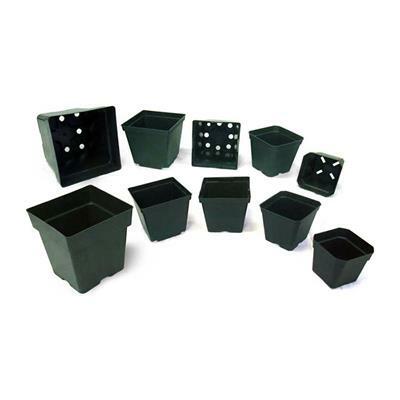 They perfectly fit both the 3 1/2x5 deep square pots as well as the 3 1/4 square pots. They hold both in place when relocating the trays in the greenhouse.They are very difficult to separate; however, if warmed in the sun, this becomes much easier. They do need a support tray underneath if all 18 holes are filled with pots. 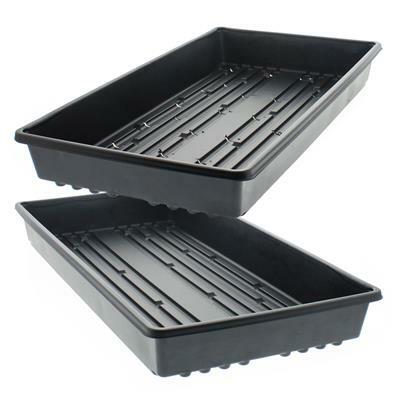 Trays for the 3.5 square, 5 deep pots are sturdy and hold the pots nice & snug. Absolutely love these trays. Makes moving these little pots so much easier when they are not tipping over and falling out of the flat. Will be buying more. This product came as described and is of great quality. These are just what I needed to get the grow season started. These are made from POLYSTYRENE, a poisonous plastic. FALSE product description. Works just like it is supposed to. Did what I expected, almost. Filling deep pots with so much soil made them very heavy. These trays held up with added support. Not sure they'd have done so well as is. Well.. pretty flimsy and very very shallow... would never buy again... my mistake I am sure... they looked deeper to me... wanted to plant seeds in the cells... I actually tossed them in the trash. These are standard little pots at a great price. These form pots and trays worked out great for us. I find these trays to be flimsy when the pots are filled. I have found the need to use trays under them for support. Love this high quality, durable product. Great for transporting my plants and reusable.Will definitely order more in the future. Trays are perfect in design and function. The drain holes in the bottom are a great idea. Good price, appropriate thickness, no extra flash stuck to trays. Will continue buying for 3 1/4 pots. While these trays are not quite as sturdy as the black form pots, they work well enough for me that I would not do without them. My biggest complaint is that they can be difficult to separate in the fifty pack case. This is my second order of these trays. I love these. For years I used either trays or web trays, they were fine, but if they weren't full pots would fall over, made watering a real pain. These are great, these are all I use anymore. Although one complaint, they tend to compress into one another and can be almost impossible to pull apart. Also, I don't know which is worse, on windy days and they are outside, in regular trays the plants are blown over, in these they stay in place and the plant gets blown around. But, the pros definitely outweigh the minor cons. These trays work perfectly for their intended use. Nice and sturdy when filled with seeding pots. Great drainage! Perfect size. Easily portable and great quality. Just what I need to get my small business started. Flimsy, so holding and carrying 32 watered 2.5 square pots is a challenge. I put a 1020 daisy tray under each one and that makes a big difference. I sure wish good quality trays were readily available. I'm going to keep using them, but I'm not impressed. These were perfect. They will do just what I need to keep my smaller pots organized. More durable than what you can buy at some stores. So far they are doing a good job at holding my pots of seedlings. Easy to carry when full of pots. These trays are good. They fit well into the flat trays and the 2.5 size fit the 2.5 pots well. These trays are elevated 1/4-1/3 inch off the bottom of the flat trays so if you bottom water the first 1/3 or so of water only humidifies the air. But as my plants grow I tend to top-water and this elevation helps to drain excess water so that the roots aren't water logged. Overall a reasonable buy. The tray seems relatively sturdy and seems like it will last a handful or two seasons. Very sturdy trays. Not worried about breaking when full. Received in less than a week. Many sizes to choose from. Will definitely order more in the future. product was excellent; however ;I should have ordered the nest larger size. I teach kids to plant pumpkins & flowers in our small greenhouse.These are great & cost effective as they keep the small pots from tipping over as the children plant their seeds. I can assign a tray for each child so as they become ready, they stop by & get the whole tray with their plants. These seedling pot holders would work great if they were big enough to fit 4 pots. 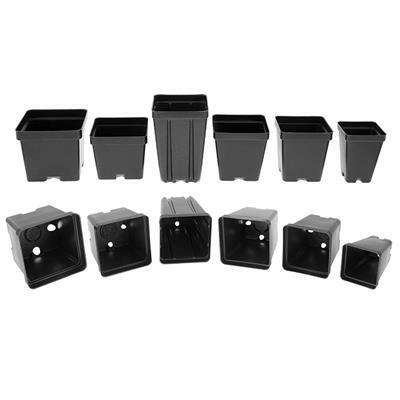 I would recommend purchasing the 3.5 pots for the 4 holders so there is enough room to fit all the plastic plant holders comfortably. Excellent for holding the small pots in a space saving way. When I sell plants at the market it keeps them spaced for easy fill in when I get home.It allows customers to see each variety arranged in rows. Trays OK. A little flimsier than I expected but still useable. 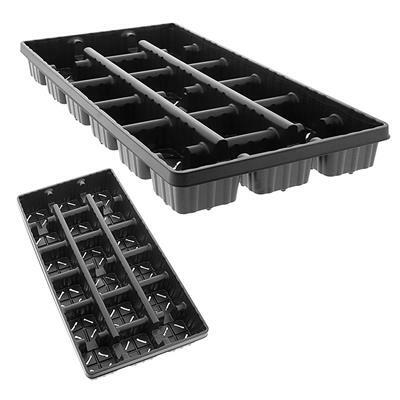 Perfect seed starters: Right size, right taper, and with the tray, easy to use and care for. Shipping for the tray was a bit much, but I'm happy with them. These trays are sturdy, but they're a little on the short side compared to the trays I've gotten from buying flats of plants at a nursery. They fit the black form pots perfectly, though, and will work just fine for my purposes. 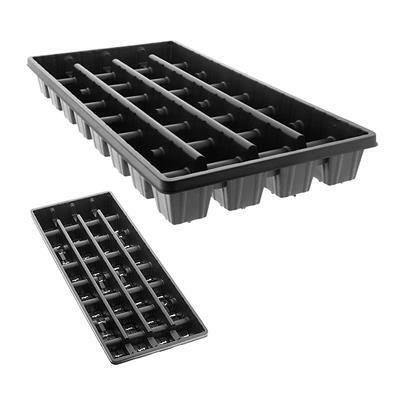 I purchased the trays that hold 18 3/25 square pots. They are convenient for moving quantaties of filled pots, and have adequate drain holes. Their ability to support 18 pots of damp soil and plants is OK..does the job if you're somewhat careful with handling. Great value. Will buy again. Product as described. recieved on time. good sturdy trays. 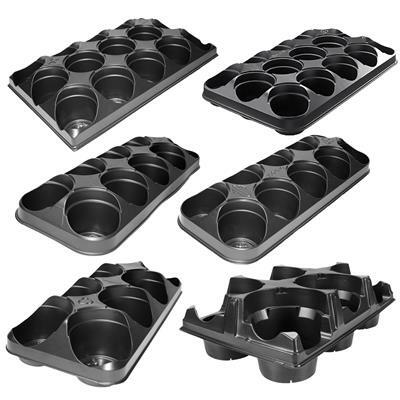 I overlooked another review that mentioned that these trays have holes in the bottom. I just grow plants for my own garden, so I wasn't familiar with the concept of a carrying tray. I was expecting something that would retain any excess water that I gave my plants. Other than this disappointment caused by my own ignorance, I am pleased with the sturdiness of the trays.If there are similar quality trays without holes in the bottom, I would appreciate it if someone would let me know. I ordered these trays along with some other things and I am very happy that I use this company over others because I received exactly what I was hoping to receive. The prices are great and so is their shipping which is lightening fast. I am a happy customer and will continue to shop here. I was using dollar store baskets to keep my four inch pots in order. 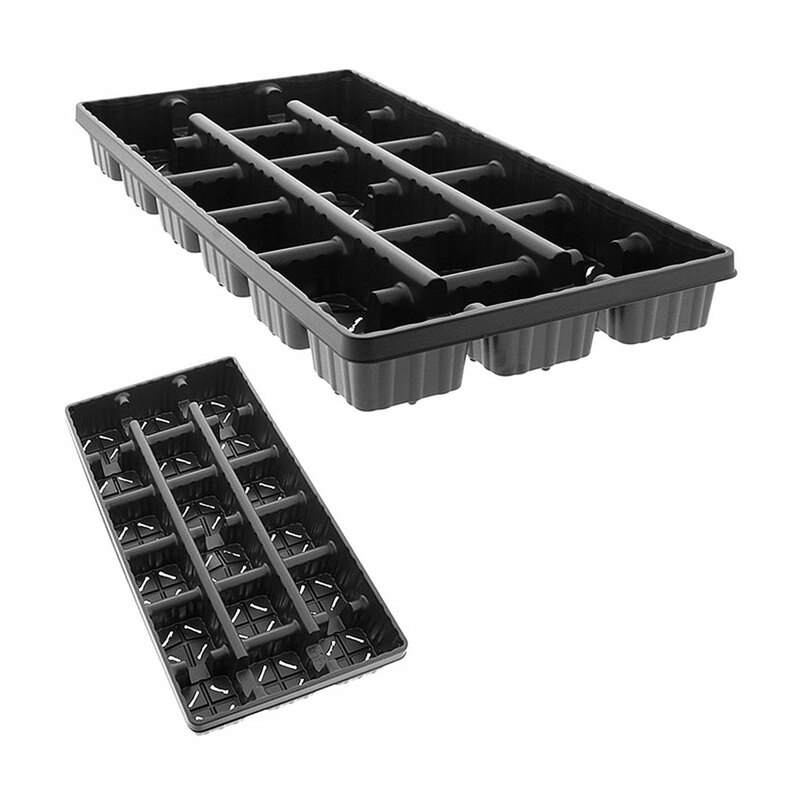 The form pocket trays can be purchased as cheaply when bought in bulk and are more professional. They are a nice weight and should be reuseable for some time. I'm pleased. I never imagined that these trays would not fit the recommended 3.5in square pots. They are so tight that you cannot fit all 18 in there. Very dissapointed...wasted $50. We will have to bring the plants to the market in cheap daisy trays. 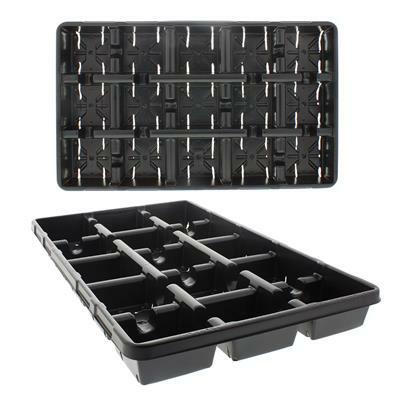 I purchased these trays and inserts to start my flowers and vegetable plants. they are priced right and the quality and thickness are perfect to last and be reused for more than a couple of years. I wish I would have purchased these years ago. 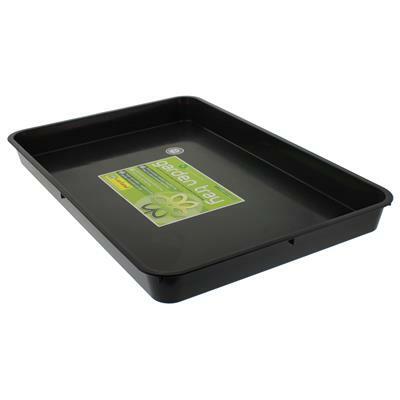 These trays are exceptional value and very useful in managing and transporting small pots. 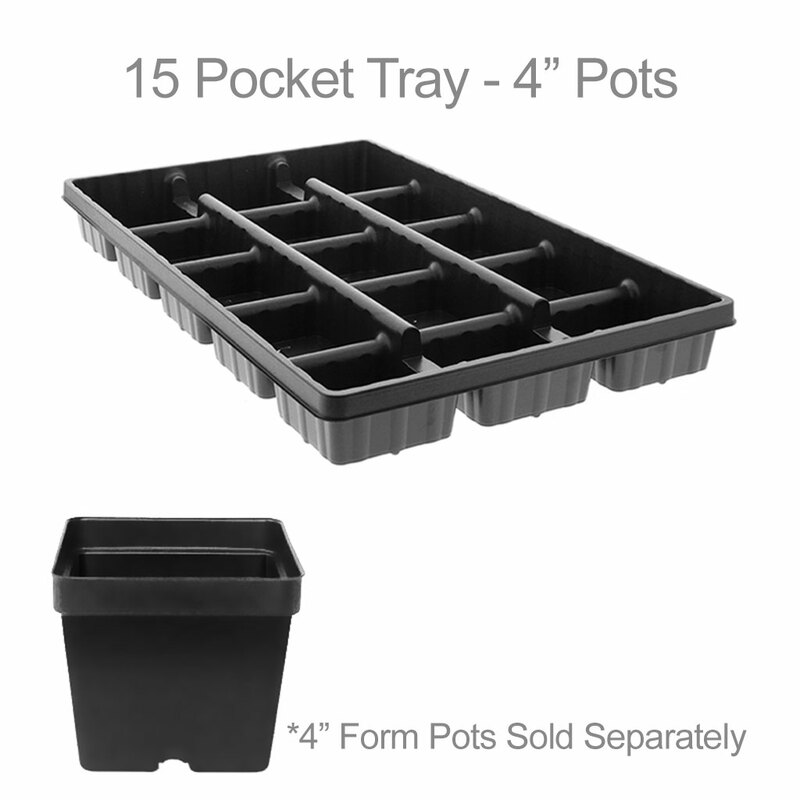 Pots fit snugly and securely in trays. These were very well made and can handle full pot with very little bending. I got the 2.5 pots and these trays hold 32 plants. The shipping was also great.